I am citizen #78,304,433,060*. That is to say that since history began I am estimated to be the 78,304,433,060th person to grace the planet we call earth. Makes me sound insignificant in the whole scheme of things and I guess even with my over-inflated ego I am. I suppose the question for me is, can I create something significant out of my insignificance? What can I do with the life of citizen #78,304,433,060? I’m realistic enough to know my own limits. 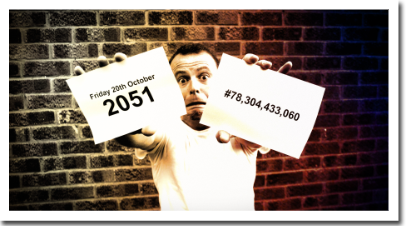 I’m unlikely to find a cure for cancer, travel to Mars or invent a transmogrifier, but when I’m lying there on Friday 20th October 2051** I don’t want to look back with a sense of frustration thinking about what I could have done. I want to take my last breath knowing that I achieved something with the life I was given. The answer as to exactly what I achieved will only come when the story concludes. No pressure then!